I spent a good part of yesterday evening doing some light maintenance on our systems; this time around it was profiling our monitors. As a rule of thumb we generally profile our monitors about once a month, the graphic intensive monitors are profiled before every print or after every over image edit. I started with profiling an Eizo 2410W and a Dell U2410. (I know miles apart, but they serve two different purposes). Profiling a monitor comes in two parts or stages – first there is profiling of the monitor(s), then there is profiling the monitor to the printer – in this case an Epson Pro 4800 ( A beast of a machine). For our profiling we use an assortment of tools, in the last year it has been carried out exclusively using X-Rite’s ColorMunki – a fantastic device that gives pretty much spot-on colour. 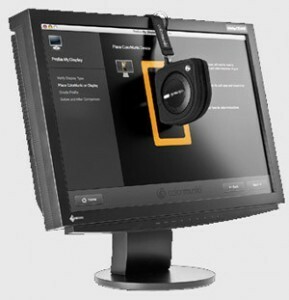 It goes through several stages of monitor calibration with the user following instructions to set the device at the aforementioned stages. Once the calibration has been completed, the profiling begins, this is where a device is hung (Literally) over the monitor and dangles over the screen with the smooth side of the ColorMunki laying flat against the monitor. The attachments have weights inserted into them that allow the device to not drop down the front of the monitor. If this sounds a bit confusing, or even maybe primitive it’s because it is. It can take a little bit of messing around to get it right. However, the results are far from primitive. The profiling goes through several stages until it is ready. Then we generally follow the printer profiling. Anyone who is familiar with this exercise or anyone who wants to try it, it is well worth reading Keith Cooper’s article and instructions of profiling with X-Rite. Once this had been carried out I went about updating various software on our system. Huge mistake, I should have done this first, ATI had a full update of one of our Graphic cards, as soon as I installed the update it re-adjusted all of my colour settings. It should not have done this. I strongly suggest you carry out any graphic card or other software / hardware that may affect your monitor profiles in advance of monitor colour profiling. https://sonet.digital/wp-content/uploads/2012/07/ColorMunki-profiling.jpg 311 300 Vincent https://sonet.digital/wp-content/uploads/2015/04/sonet_340.gif Vincent2012-06-13 08:55:212017-09-15 11:30:09Monitor Colour Profiling Again! E-Privacy Directive and How it Affects UK Websites Pinterest Spam Filters?